Sometimes the most fascinating aspect of a flower is before it even arrives. I love to watch the progressive morphing of the Allium bulgaricum as it pushes through the ground early in my perennial bed, usually before I’ve even managed to clean off the winter debris. These tall, 36″ stalks are very strong and have never needed staking. These particular bulbs have been living in my garden since 2003 after I bought them at an after-season sale at Home Depot. I always scour the sales in various Home Depot stores in my area to capture the treasures left behind by the undiscerning customers. Allium bulgaricum breaking through the tunicate. As the flower grows you can see it bulging through the paper thin protective membrane covering. I walk daily through my perennial bed waiting for the first tear in the parchment like shield. I would liken it to the first beak marks I’ve seen when a chick is breaking out of it’s shell. Not that I’ve seen chicks very often since I was raised in Brooklyn, which is not noted for farmland. The flowers pounce forth in a gleeful display of empowerment and spread their wings in umbel fashion sitting proudly on tall stalks overlooking a still short, unfolding and early season perennial garden. These are not glamorous flowers in my opinion but they always add weeks of drama to my early spring theater. Not to say that I don’t have any ivy, pachysandra or periwinkle in my garden but I try each year to add more interesting ground covers and reduce the spread of the ordinary. Epimedium x versicolor ‘Sulphureum’ has proven to be a valuable asset to me since I can play with the sweet pale yellow color of the gentle flowers while they are in bloom in April here on Long Island. One of the chores that I need to do very early in the season, however, is to cut back last year’s growth which becomes ragtag during the winter. This allows the enjoyment of the delicate sprays of two-toned flowers. This is the only maintenance care I need to give this ground cover. Since this plant has flourished in my garden, each year I am able to divide and share the wealth into other sections of the garden and in fits of generosity even give them to other gardening enthusiasts like myself. I always try to keep a bed of them close to the entrance though since they bloom so early that I want to enjoy each day with them. In 2001 I transplanted a Rhododendron PJM that was growing under some hemlocks that were, at the time, providing too much shade. I planted it just off the entry deck and placed some epimedium in the general area. Together these bloom in April providing a nice combination of purple and yellow to brighten up my day. Once the blooming season is over, the leaves open and create a wonderful and carefree weed suppresser. I have not experienced any insect damage which otherwise would make the planting unattractive. Less pachysandra, more epimedium. Nice goal. I have designed a rather informal garden with meandering paths using a variety of materials. At the end of, or just around the corner of each path, is some type of focal point, which draws you forward, in eager exploration. My garden is about moving through and around rather than sitting in one location and observing the whole. The irregular bluestone pavers serve as the path to bring you from the front entrance, around the deck, and under the aging mountain laurels. The azaleas to the left are rather dense so you don’t see the deck but instead have the sense that you’re walking through a woodland. The path is narrow and the laurels create a ceiling of sorts until you emerge into the openness of the front garden. Frank Lloyd Wright designed the ceilings in his houses to give the same effect of enclosure and expansion as you walked from room to room. Variation of space enhances the experience of the individual as they explore the design. This giant oak serves to keep the garden and deck cool all summer and feed the squirrels all winter with it’s abundance of acorns. In the fall you need to sit on the deck with an umbrella over your head since the acorns come down with such determination. I am an Artist so color, texture, scale, focal points and other factors drive much of my garden design. My son gave this Japanese Maple, Acer palmatum ‘Dissectum’ to me many years ago. Not knowing the eventual size of the tree I placed it right by the deck where I would be able to enjoy the delicate filigreed leaves all summer. For a few short weeks in May this wonderful, almost stage setting display of cool pink azaleas blooms as a backdrop to set off the wine colored purple leaves of the maple. The azaleas were already on the property in this location when I bought the property in 1989 though they have certainly grown and expanded. As a ground cover underneath the mounding maple, I planted Lysimachia nummularia ‘Aurea’, commonly known as Creeping Jenny. The bright, almost chartreuse yellow offsets and lightens the ground underneath the purple leaves of the maple lightening an otherwise potentially dark corner. Happily, both the maple and the nummularia retain their vibrant colors the entire summer. I would like to take credit for the whimsical placement of the dandelions in front of the maple but alas, that was the creative idea of Mother Nature. My garden doesn’t go into the winter season all tidy & neat. 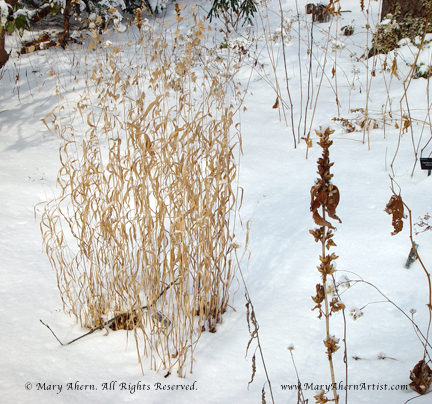 I enjoy seeing seed heads popping through the snow. The visual treat of shadows cast about by the wind, dancing along the walls seen from the windows of my warm home. From my dining room window, the seed heads of tall grasses are seen swaying in the breeze with the floodlight of the pure winter sun behind them. From the kitchen window the afternoon sun gleams through the slivers of peeling bark of the Acer griseum, wisely named Paperbark Maple. Tissue thin decorations provided by nature. What a joy to watch teensy birds land on the seed stalks of last summer’s Echinacea, barely bending them. My winter garden provides them a smorgasbord of treats so they keep coming back for more. We have an agreement. The evergreen stalwarts of my woodland garden, the hellebores & Polystichum acrostichoides (what a fabulous name for a Christmas fern), help to delineate the pathways once the snow has fallen. They’re markers keeping me on the right track. I need that help quite often. The hellebores serve another important service. They are the harbingers of spring. As I enjoy the subtle visual treats of winter I can’t help but poke underneath their large leaves seeking hungrily the buds signaling the beginnings of a new season of visual excitement. Step 1 of Rear Garden Design Project. In 1989 I bought my home in Northport Long Island NY. A cute little two-bedroom cape but I really bought it for the garden. It had a good skeletal structure. The property is triangular, set on a corner at a point of two (actually three) converging streets. That the perimeter is not rectangular adds to the illusion that the area is greater then its actual half-acre on the tax code. The original garden behind the house was merely a worn path skirting a slight mound of earth leading to the rear foundation. The foundation planting consisted of two Euonymus alatus shrubs perched on each outside corner. In 2000 after looking around for a new home in the area which my new husband Dave and I could share together, we decided to stay on this little piece of earth and build a home specific to our evolving needs. One of the main reasons for staying was my love of the garden I’d worked on for a decade and the vision I’d been working towards. In March of 2000 we began to break ground on what was to be a momentous change in our lives. We were gutting the entire house and rebuilding the interior into three floors. The rear of our home was to become the guest room entrance for the finished lower level which we were adding to the existing structure. The tiny basement windows would be replaced and the entire rear mound would be excavated to create a grand entrance. The modest little bluestone path was to be replaced by a walkway leading to a Japanese inspired bridge, dry stream bed and planting terraces. As part of my degree in Landscape Design at Farmingdale I designed and drew the plans for this project. It entailed moving water lines, electrical work and ensuring proper drainage management. Pretty complex and really creative.